Pennwood Farmhouse in Penn, near Wolverhampton, Staffordshire sleeps 8 people. Pennwood Farmhouse near Wolverhampton is a detached farmhouse with panoramic countryside views of Penn Common and over the Clee Hills, where the city border of Wolverhampton meets the rural countryside of South Staffordshire. This is an ideal escape for family and friends looking to meet up for holidays, short breaks, celebrations and visit the surrounding area. The farmhouse is located next to a livery yard and within 220 yards of the pub and a golf course. 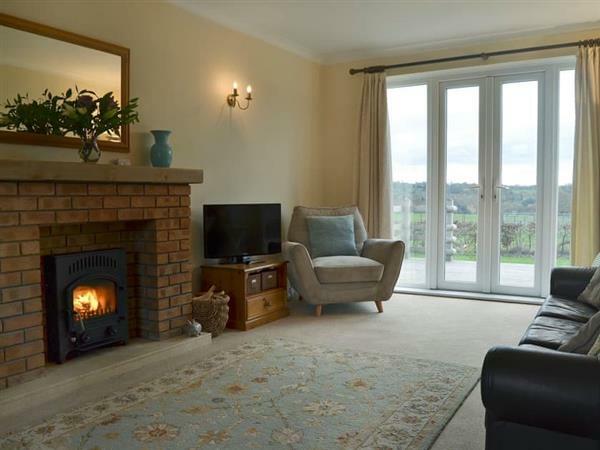 The property is very spacious, has lovely wood burner to cosy in front of after a day out exploring and a wonderful decked area overlooking the garden and the surrounding views. Only 2 miles away, you will find yourself in Wolverhampton city centre, heart of the West Midlands. Wolverhampton offers a wealth of friendly independent retailers, high street brands and markets in addition to two impressive purpose built shopping centres and an art gallery. Other places of interest close by are Wightwick Manor and gardens, a Victorian built property influenced by William Morris, Halfpenny Green Vineyards, Highgate Common Nature Reserve, Baggeridge Country Park, Chillington Hall and Moseley Old Hall an Elizabethan farmhouse. The historic town of Stourbridge famous for its glass industry is 10 miles away. Dudley with its famous Black Country Living Museum, Dudley Zoo, Canals and parks is just over 5 miles. The city of Birmingham with its many shops, exhibition, concert venues and leisure is approximately 20 miles. There is a shop 450 yards from Pennwood Farmhouse near Wolverhampton. With the pub and restaurant 220 yards from Pennwood Farmhouse. Living room: With wood burner, 32 Freeview TV, Blu-ray player and patio doors. Kitchen: With electric oven, gas hob, electric range, microwave, fridge/freezer and dishwasher. Bedroom 1: With four poster king-size bed and double sofa bed (for flexible sleeping arrangements) and Freeview TV. Pets allowed at Pennwood Farmhouse. For a better idea of where Pennwood Farmhouse is, you can see Pennwood Farmhouse on the map below. Pennwood Farmhouse is in Staffordshire; should you be on the lookout for a special offer, you can find all the special offers in Staffordshire. It's always worth checking to see what is on offer at the moment. Do you want to holiday near Pennwood Farmhouse (UKC3853), you can see other cottages within 25 miles of Pennwood Farmhouse; have a look to find your perfect holiday location.